Just like the wild west, the landscape of pest control is competitive, dynamic, and intense. Unlike the wild west, there are no stories involving cattle drives, bank robbers, or train rides in the history of Buckaroo Pest Protection. Our family business is rooted in Texas and we happily serve the following cities: McKinney, Allen, Murphy, Lucas, Fairview, Frisco, Plano, Prosper, Richardson, Melissa, Celina and north Dallas. What makes us different? Our love of cowboy hats aside, we provide our customers with a unique experience. We protect your loved ones from pests and pesticide exposure by using advanced placement techniques, botanical-based materials, and barricades. We know you’re busy, and we understand that what the modern family wants in the face of a pest problem is a company that comes in, solves their current problem and takes steps to prevent future problems… all without bugging them too much. We create customized treatment plans that fit your specific home, your specific needs, and your specific timeline. After the initial treatment, we set up automatic scheduling, service, and payment plans using our “A.N.T.S.” (Automatic Notification Technology System) approach so the critters in your home get corralled without the need for waiting on a service call or any action being taken on your part. 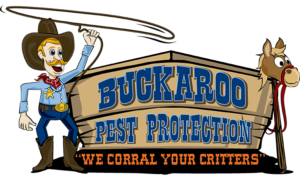 The entire posse employed by Buckaroo Pest Protection must pass our extensive background checks and are specifically chosen for their experience, competence, and courtesy. We take your safety and comfort seriously, which is why all of our technicians will treat your home just like their own. We also have a Board Certified Entomologist on staff to help us move forward when it comes to developing new ways to make your life a little bit easier, a little bit simpler, and a lot more pest free. Want to know more? You can lasso up some information about different types of pests we protect against, the services we provide, or just schedule a service today.